You might not know that I’ve been working on a PhD for what seems like my entire life. It’s made me stupider in some ways, smarter (?) in others, and generally convinced that I take criticism wayyyy tooo personally. However, all that self awareness aside, the best part of the PhD is that it is now OVER. Yes, the good news is that I passed my doctoral defense this week with only eeny meeny corrections, and as of 2011, can call myself Doctor Adventure. (That sounds like a really cheesy character in a comic book). And, I also took the Foreign Service exam, yet again. Whoo hoo. I think once you take it the 4th time, it’s no longer as exciting. I took it the first time in 2004, and passed, back when the test lasted pretty much all day, and tested a lot more things. Now, the test is shorter, possibly easier (or is it just that I’ve taken it so often I have seen all the questions before? ), and graded on a curve such that the top x% of takers “pass” regardless of score. There were some lovely essays to write, multiple choice questions on math, pop culture, American history, world politics… and grammar. YEAH. I heart the grammar section. Anyway, after this test, there’s an essay to write, and an oral exam/interview/group work evaluation to do, assuming I pass through each hurdle. And, then, you wait on a list of people who qualify for the job for many months, before doing it all again because there are a lot of good candidates, and your number never came up. So, we’ll see where this test takes me. It would be really nice for the Adventures to be a tandem couple; both of us like to be doing ‘important things.’ Let’s hope DoS thinks we should be one too. 1. We think we’ve bought a car. Of course, the last 2 cars completely fell th rough, but at this point we’ve had an inspection and handed over a check-to-be-cashed, so we’re pretty confident this one will work out. It’s a bit bigger than the MINI, but still no road monster. 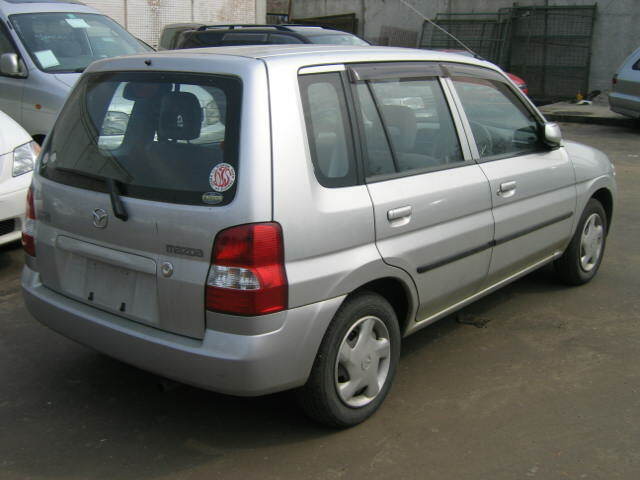 It’s called a Mazda Demio and looks a bit like this, but I really just borrowed this pic from an old used-car ad. Supposedly it’s got more room in the trunk than the MINI, and that second set of doors will come in handy when we’re trying to ride behind our future “driver.” So, I guess we’ll be adding to our household staff soon. 2. We received a present! It’s sitting under the 1.5′ tree we have until our stuff comes, next to a pinecone and a snowman, each about 2-3″ tall. It’s a tiny Christmas. 3. The weather is AWESOME. Generally clear, but not hot. The locals are bundled up in scarves and gloves, but I think it’s about 75 out? 4. I sent in my dissertation draft last week, the one which is supposed to be the last one. But, haven’t heard whether it is yet. 5. We’ve already been to two Xmas parties, and since we couldn’t get enough pie, I made a cherry one yesterday. YUM. 6. I’m applying for a job here at the embassy, so keep your hopes up for me. It seems right up my alley, and in line with my training and career experience. Someone else wondered to me whether there was any one here who could even fulfill the specified requirements and limitations, but I think I do… so here’s hoping! It would be my highest paid gig yet, if you don’t count the various perks of working as the faculty-in-residence including free housing. So, once again, not a particularly substantive post, but a busy week of emailing, hoping, and applying, in relation to #4 and #6.